The following events were listed during the week of 17-24 September in “Google News” under the key phrases “Día Internacional de la Paz”, “Dia Internacional da Paz,” or “International Day of Peace. For events elsewhere in the world click here. 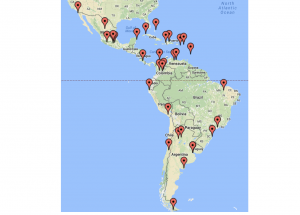 As seen on the map above, there were articles about 33 events in 14 countries of Latin America and the Caribbean. 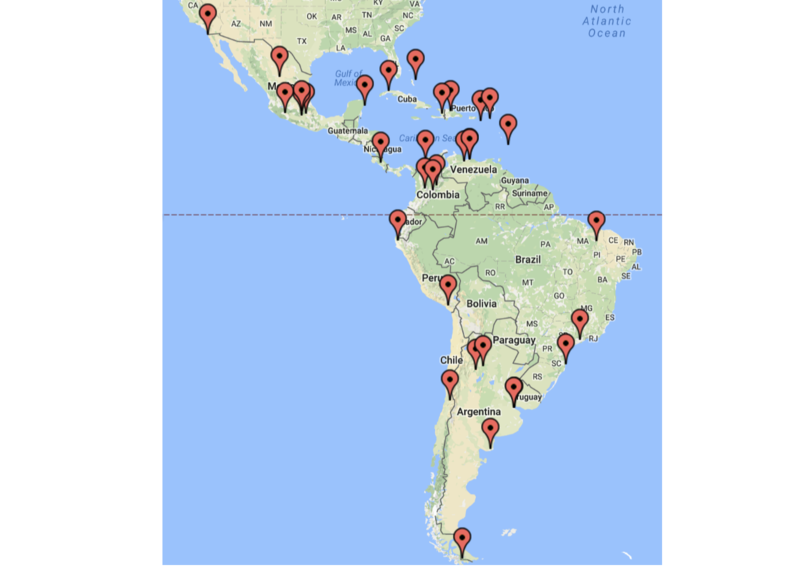 Havana, Cuba: With the assistance of academics and representatives of social movements, workers and peasants from 12 countries will meet in Havana from 21 to 23 September, the first international seminar on Realities and Challenges of the Proclamation of Latin America and the Caribbean as a Zone of Peace. Bogota, Colombia: More than 120 artists gathered in the central Plaza de Bolivar to invite Colombians to “weave peace” through a concert that combines music, dance and multimedia projections. Speakers included 17 actors on stage, the National Symphony Orchestra, the Colombia Opera Chorus and members of the Victus laboratory – made up of victims of armed conflict, a metaphor for the absurdity of war. San Jose, Costa Rica: About 300 young people gathered in Independence Park and the Cartago Municipal Amphitheatre to celebrate the International Day of Peace with interactive and educational activities that culminated with the presentation of the results of the edition 2016 of the contest “Let’s sing for peace “. Torreon, Coahuila, Mexico: During the ceremony commemorating the International Day of Peace, mayor Maria Luisa Gonzalez Achem invited the children and young people present to make peace a way of life, founded on the values ​​of respect and cordiality. The Mayor was accompanied by students of the primary school Felicitas Cordero Villela whom she invited to spread a message of peace among their peers and family, and to avoid actions such as bullying. Caracas, Venezuela: State agencies conducted a conservatory in Nueva Esparta, aimed at young people of this island in order to promote peace and prevent violence in communities. The activity, part of the International Day of Peace, was held in the House of Culture Manuel Placido Maneiro Pampatar, located in the municipality Maneiro, where 50 young people participated. Santiago, Chile: The representatives of different religions and spiritual traditions, with active communities in Chile, gathered to pray on Wednesday 21 September, generating a space of fraternity and deep spirituality in the Hall of San Ignacio de Santiago. The slogan was “Peace is Love made Coexistence”. Representatives and religious leaders of Judaism, Buddhism, Mapuche, Islam, Sikhism, pentecostal, Baha’i Faith, Orthodox, mainline Protestant churches and Brahma Kumaris attended. The Catholic Church was represented by Mons. Jorge Concha y Rev. P. Jose Manuel Arenas. Vicente Lopez, Argentina: Under the slogan “Build Peace Together in our community, country and planet “, the Civil Association Mil Milenios and the Bethlehem Community organized an event for the International Day of Peace. They called on all individuals and educational, civic and governmental institutions to share activities, workshops and reflections as a way of building a culture of peace. Valenia, Carabobo, Venezuela: The Crime Prevention Division of Carabobo State developed cultural and recreational activities to commemorate the International Day of Peace. Their event, which was took place in the municipality of San Joaquin, started with a walk from the Indiana neighborhood to the Plaza Bolivar of that city, where attendees enjoyed theatrical plays and other activities to promote peace. Apatzingan, Michoacan, Mexico: In the commemorative framework of the International Day of Peace, the State Government and the City Hall of Apatzingan celebrated the day with various civic, recreational and cultural activities that were attended by municipal and state authorities as well as basic level, upper middle and upper level institutions of the municipality. Moquegua, Peru: Students from the college Juan Scarsi Valdivia marched through the main streets of their district of Samegua. The family prosecutor Mirtha Diana Morales Portilla explained that such a mobilization seek to encourage a culture of peace in the students as well as the general population. Another similar march takes place in the town center of Chen Chen. Meanwhile in the province of Ilo, William Prescott college students went to the Provincial Municipality to deliver a letter of peace to the mayor, William Valdivia Davila. Mexico City, Mexico: The collective, “CPAZ” composed of 15 civil associations, will perform two activities for the commemoration of the International Day of Peace. The will meet at Chapultepec Avenue where 15 associations will carry out different activities, with the objective to serve the needs of everyone. ​​Santiago de los Caballeros, Dominican Republic: Several institutions celebrated World Peace Day with various events. A joint effort of the Office of the First Lady, the Archbishop of Santiago, City Hall and Local Education, concentrated hundreds of school and public officials, in an event entitled “In peace we live better”. For his part, Mayor Abel Martinez, called on the people of Santiago to work for a culture of peace. Buenos Aires, Argentina: Provincial senator Sebastian Galmarini participated in the celebration of the International Day Peace which was organized by the civil association Mil Milenios de Paz and the Belem Community in the Quinta Trabucco of Vicente Lopez; The theme of the meeting which brought together educational, civic and government institutions was “Building Peace Together in our community, country and planet.” The president of Mil Milenios de Paz, Inés Palomeque, invited the legislator to sign the Peace Accord. Cozumel, Mexico : In order to celebrate the “International Day of Peace” the municipal government held a very emotional ceremony that honored the members of the Student council of the editions 2014, 2015, 2016. The youth representative Niza Teresita Vivas Chacón, who had been Municipal President for a Day in 2014, expressed their desire for world peace. Santiago del Estero, Argentina: Organized by the Circle Dance Group of Santiago del Estero, there will be a meeting to celebrate the International Day of peace. The circle dances have been part of this tribute for several years and since 2015 they have been part of the activities of the Peace Council of Argentina. Tunja, Boyaca, Colombia: To commemorate the international day of peace, the biggest event will take place in San Pablo de Borbur where at least 300 young leaders from 14 to 28 years old will meet to share experiences during the First Meeting of Youth for Peace of Western Boyaca. They are young leaders from the municipalities of Chiquinquirá, Buenavista, Coper, La Victoria, San Miguel de Sema, Pauna, Quípama, Muzo, Briceño, Caldas, Maripí, Otanche, Tununguá, San Pablo de Borbur y Saboya. On Friday and Saturday, they participate in different academic, cultural and educational activities. Viedma, Argentina: Paper cranes and 24 degree heat was the perfect way to enjoy the first day of spring with various artistic and cultural events in parallel for World Peace Day. Over a thousand paper cranes were displayed. Maiquetía, Vargas, Venezuela: The people of Vargas raised their voices for peace and respect for human rights during a demonstration in Maiquetia, a populous parish of Vargas state, which marked the beginning of activities of the International Week of Peace, in response to the guidelines of the President of the Republic, Nicolas Maduro, to reject the intentions of those who, from the right, want to promote the culture of violence to destabilize the country. Zacatepec, Mexico: The regional competition “Painting a World for the Right to peace “organized by the CDHEM was attended by about 200 middle school students in the southern region. It aimed to promote peace among young people, against the scenario of violence taking place in the country. Puebla, Mexico: As part of the commemoration of the Day International peace, along with a free concert at the Auditorium of the Reformation, the 2016 Conference for peace officially opened in Puebla, a series of events and activities that aim to promote the culture of peace . From September 21 to October 5 with a closing concert in the BUAP, the Days of Peace will be held in various parts of the city, with 20 free activities among which are concerts, conservatories and workshops. Tijuana, Mexico: This year’s March for Peace will take place in this border city. According to the organizers, led by the collective Tijuana Propone, “the march was born from the initiative to promote unity and to add a symbol of peace for the city.” To participate, the organizers are urging people to wear white clothing as a symbol of peace and unity. This edition will be the fourth annual walk for peace, celebrating the International Day of Peace; previous editions have drawn more than five thousand participants. Florianopolis, Brazil: Florianopolis wants to become the first capital of World Peace. The was revealed by Dulce Magalhães, President of the 10th World Peace Forum. And the title may be merited thanks to the 200 people who participated in a flash mob (immediate mobilization) in front of the Metropolitan Cathedral yesterday, the International Day of Peace. Moving to the sound of a Hindu mantra and the rhythm of samba, teachers and students of dance, physical education teachers, students of public and private networks and young peace activists from Spain, Italy and Egypt presented a show to call attention to the opening of the Forum. São José dos Campos, Brazil: The event “I offer peace to you”, an exchange of ideas, ideals and inspiring actions that lead to inner peace, will take place in Spider Vicentina Park on September 25, in celebration of the International Day of peace. There will be space for children’s stories, children’s yoga and music. A therapists corner will provide free application of Reiki, massage and Pranic healing. Everyone can participate in the conferences and experiences, yoga, Chinese body practices, and collective picnic. Teresina, Piauí, Brazil: In celebration of the International Day of peace, the Public Ministry of the State of Piauí promoted a conference on the culture of peace in the auditorium of the State College Zacharias de Goes – Liceu Piauiense. The initiative promotes the struggle against school problems such as discipline and bullying, among other issues. San Martin [Caribbean]: As part of the International Day of Peace the UNESCO Elementary School Aline Hanson Sandy Ground “The Friendly School” is organizing its peace march on Wednesday. For 3 years now, the UNESCO school in Sandy Ground, celebrated the International Peace Day in the streets of the neighborhood, with a march which involved the educational community as a whole. St Croix, Virgin Islands: Peace advocates filled the Evans Center at the University of the Virgin Islands, St. Croix campus, on Friday to celebrate World Peace Day with poetry, song and motivational speeches. Haiti: The United Nations in Haiti commemorated the International Day of Peace with the launch of the CD “Vwa Ayiti Pou Lapé” (Voices of Haiti for Peace), result of 18 months of collaborative work between James Germain, Emeline Michel and Beethova Obas, renowned Haitian artists who have held workshops for over 200 young singers and musicians of sensitive areas from 10 cities. A total of ten songs reflecting the musical mosaic of Haiti and combining many influences of musical styles that this Caribbean countries make up this album; each of them recalls that the future of Haiti requires stability and a rejection of any form of violence. Barbados: Hundreds of Barbadians took part in yesterday’s Walk For Peace in The City. Among the local charities, groups and organisations represented were: Lions Club Barbados, members of the Barbados Workers’ Union (BWU), Junior Chamber International (JCI) Barbados and the Barbados Defence Force. BWU General Secretary, Toni Moore; Member of Parliament for St. Joseph, Dale Marshall; the Barbados Labour Party’s candidate for St. Philip West, John King; Chief Executive Officer and Founder of Hope Transplant International, Reverend Michael Steele, also took part in the Walk.